The sultan of Sokoto and the president-general of Nigerian Supreme Council for Islamic Affair, Muhammad Sa’ad Abubakar lll, in a meeting held in his place, have said that Nigeria remains a beautiful country and that Nigerian people love themselves. This is disgusting. "NIGERIA REMAINS A BEAUTIFUL COUNTRY....."
This is a lie from the pit of hell. I cannot fathom how this Hausa/Fulanis Islamic emirate thinks the world can be deceived with their unending lies. Gone are the days when the world takes any word that comes from men like this serious because the truth is glaring at everybody now. The fact remains that the various indigenous peoples that were forced together to form the fraud called Nigeria has come to their senses, and wants a dissolution of this unlawful union. Nigerians do not love themselves, neither is Nigeria beautiful in any way. Since the amalgamation of Nigeria in 1914, the three major indigenous people in Nigeria; Biafra, Oduduwa, and Arewa have been like cat and dog and to worsen the matter, the same Hausa/Fulani that is talking about Nigerians Loving themselves are the people who have demonstrated the highest level of hatred on the other indigenous people. These are the same people who said they are born to rule other people, the same people who are always igniting religious crises and political crises. These are the only people who are practicing Islamic sharia law in a country they claim is a secular country. Hausa/Fulani are the people who are intimidating and killing people who do not believe in their religion, they are burning churches, killing Christians and people of other religions and they claim that Nigeria practices a democratic system of government where there is freedom of worship, speech, and expression. If Nigerians love themselves, why do Hausa/Fulani and their Yoruba counterpart burn down and demolishes Biafra shops in their land? Anyway, maybe Nigeria is beautiful when Boko haram is massacring people everywhere, Fulani herdsmen are massacring farmers, destroying farmlands and produce, razing buildings and claiming other people's land. Nigeria is beautiful when a tyrant like Muhammadu Buhari is the president, with promises to Islamize the entire country by any means necessary. Nigeria is beautiful even with Muhammadu Buhari’s unfriendly economic policies and his cluelessness. Is Nigeria really beautiful? When human right abusers go scot free? 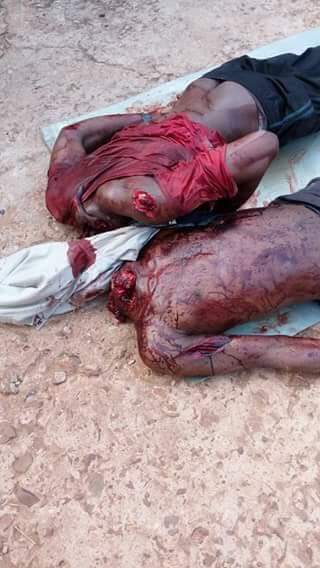 Nigerian army who should be waging war against Boko haram terrorist in sambisa forest are now in the city with the police and navy, shooting unarmed protesters, DSS kidnapping and secretly killing young men of Biafra extraction. MUST READ: WHY WE MUST REJECT THE CREATION OF GRAZING RESERVES FOR FULANI HERDSMEN IN BIAFRALAND(PART 2). Is it true that Nigeria is beautiful when there is no power supply, no good road? Do you know that the hands that feed Nigeria still drink the same water they defecate and graduates are jobless? Well, I agree with the sultan of Sokoto. Nigeria is beautiful because Hausa/Fulanis are enjoying the oil in Biafra land while our waters have been polluted and our farmlands destroyed with oil spillages. However, the world should know that Nigeria is dead and cannot be resurrected.